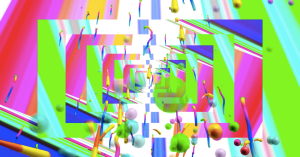 The exhibition–-screen saver by multidisciplinary artists and musician from New York. Yoshi Sodeoka is mostly known for his unique conceptual video albums that range between psychedelia (on a visual level) and prog-rock (on an audio level), and the body of video works, commissioned music videos (e.g. Tame Impala, Wunder Wunder, Beck, The Presets and tohers), GIFs and digital prints. For his work is quite typical lo-fi aesthetics, the use of analog-digital intermixes and distortion, psychedelic motifs and hyper-real RGB colours, and, most significantly, translation of music into visual language (especially the noise music). Sodeoka’s artistic projects have been shown all over the world, from London’s Tate Britain, New York City’s Deitch Projects, The Creators Project’s La Gaîté lyrique in Paris, Edinburgh’s MU, São Paulo’s Rojo Nova, Barcelona’s OFFF, Baltimore Museum of Art, London’s OneDotZero, Barcelona’s Sonar Festival, Haifa Museum Israel, Berlin’s Transmediale and Whitney Museum of America’s Art, Artport, and also at PAF Olomouc. Sodeoka’s work is in the permanent collections of Museum of the Moving Image, the San Francisco Museum of Modern Art. Sodeoka’s experimental video art label, Undervolt & Co, was founded in 2013. For further insight into Sodeoka’s techniques, themes and works, read e.g. the extensive article by Lital Kahikin in Redefine or interview by Marie Meixnerová with Yoshi Sodeoka for PAF 2013. Interview between Mary Meixner and Yoshi Sodeoka for ScreenSaverGallery soon.